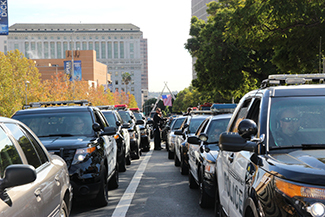 A sea of dark blue uniformed officers and mourners dressed in black filled a downtown Los Angeles cathedral on Monday for the funeral of slain Downey Police Officer Ricardo Galvez. Family, friends and law enforcement officials from Southern California and across the country attended the funeral service held at the Cathedral of Our Lady of the Angels in L.A. A gravesite salute with full police honors was held immediately after the service at Rose Hills Memorial Park in Whittier. On Nov. 18, Galvez was fatally shot while sitting in his BMW — dressed in street clothes — in a public parking lot adjacent to the Downey police station. He died at the scene. 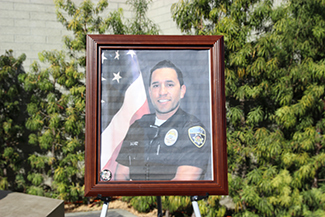 The 29-year-old is the first officer to be gunned down in Downey Police Department history. Three people were arrested and charged with his murder. Police and prosecutors believe that the killing was the result of a “botched robbery attempt” and that the trio did not realize he was a police officer. Steven Knott, 18, Jeremy Anthony Alvarez, 21, and Abel Diaz, 17, are all due in court for arraignment on Dec. 17. In addition to murder charges (including the the special circumstance allegation of murder during an attempted robbery), the three are facing a single count of second-degree robbery, along with gang and gun allegations. “Today we will not dwell on the circumstances that surrounded his death, instead we will focus on and celebrate his life and the extraordinary man that he was,” said Downey police Chief Carl Charles. Galvez, affectionately known as “Ricky,” was from Whittier and is survived by his mother, Margarita; brother, Pedro; and sisters, Sandra and Nancy. “This is a place I never imagined I’d be standing … mourning the loss of one of our own,” Downey Mayor Luis Marquez said during the service. The five-year veteran of the department was also in the U.S. Marine Corps. Prior to becoming a police officer, he served two tours of duty in Iraq and Afghanistan. Fellow Downey Police Officer Drew Lofquist delivers a eulogy at Officer Ricky Galvez's funeral on Mon., Nov. 30, 2015. Galvez’s friend and fellow Downey police Officer Drew Lofquist delivered a touching eulogy to close the service. He recalled movie nights where the two officers would watch the 2012 crime drama “End of Watch” — Galvez’s favorite movie. “In true Ricky fashion, I will leave you with these words of encouragement and a message to the forces of evil, a quote from Ricky’s favorite movie, 'End of Watch,'” Lofquist said. “...Behind my badge is a heart like yours. I bleed, I think, I love, and yes I can be killed. And although I am but one man, I have thousands of brothers and sisters who are the same as me. They will lay down their lives for me, and I them. We stand watch together. The thin-blue-line, protecting the prey from the predators, the good from the bad. We are the police," he read. Following the service, Lt. Mark McDaniel of the Downey Police Department fought back tears as he stood just feet away from Galvez’s American flag-draped casket inside a hearse. 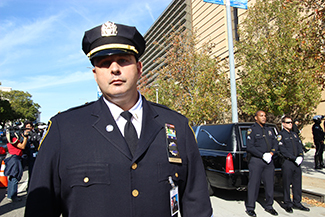 Police officers from around the country traveled to Los Angeles to mourn their “brother in blue.” New York Police Department Lt. Christopher Popovic and his fellow officers said they attended the funeral to stand in “solidarity” with the Downey Police Department. Reach Contributor Whitney Ashton here or follow her on Twitter here.